I’ve created a page that expands on this post and should provide a good introduction to our thinking about the three most intriguing types of feeding sign, with images from the second and third categories. Think of this post as the shorter version. Over the years, I have written a great deal about bark scaling and the types of work I think are diagnostic for Ivory-billed Woodpecker; however, I don’t feel that I’ve been effective enough at conveying the nuances of what I look for in situ. I’m going to try a somewhat different approach using images that have been posted previously. I will be focusing on the category of bark scaling that I think is most compelling for Ivory-billed Woodpecker. I hope that the tiled mosaic layout will make it easier to get my points across. 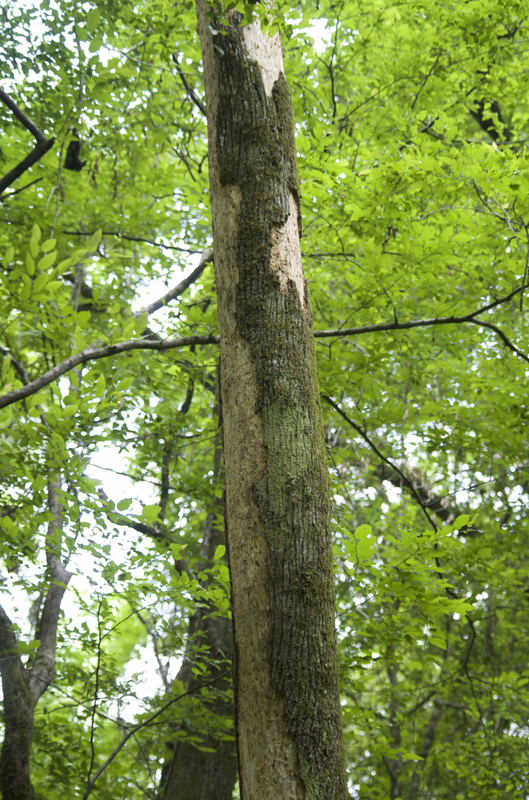 The scaling I find most compelling for ivorybill is on hickories, mostly or all bitternut hickories (Carya cordiformis). This work represents a relatively small subset of the suspected ivorybill feeding sign we’ve found, as would be expected given that under 10% of trees in the area are hickories. It is not the type of foraging sign that Tanner emphasized, and I’m not suggesting that scaling on boles is the ivorybill’s predominant foraging strategy. I emphasize this work because it has a distinctive appearance, one that differs dramatically from presumed Pileated Woodpecker foraging sign on the same species. 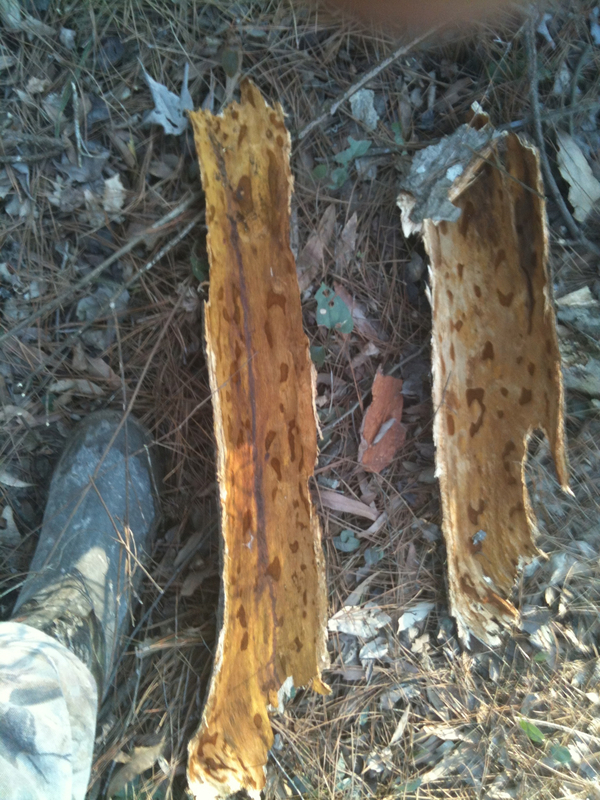 The above images show presumed Pileated Woodpecker work on a recently dead bitternut hickory found last February. It seems reasonable to infer that this is Pileated work because of its extensiveness and the abundance of fresh chips at the base of the snag, suggesting the work was recent and was done by a large woodpecker. Some readers might be inclined to think of this as “scaling”, when in fact it is shallow excavation. The small size of the chips and the fact that some of the chips are sapwood, not bark, support this idea. Contrast the roughened appearance of the sapwood with the clean bark removal in the images below. Also contrast the extensiveness; while the work shown above involves fairly large areas, it pales in comparison to the very extensive scaling shown below. 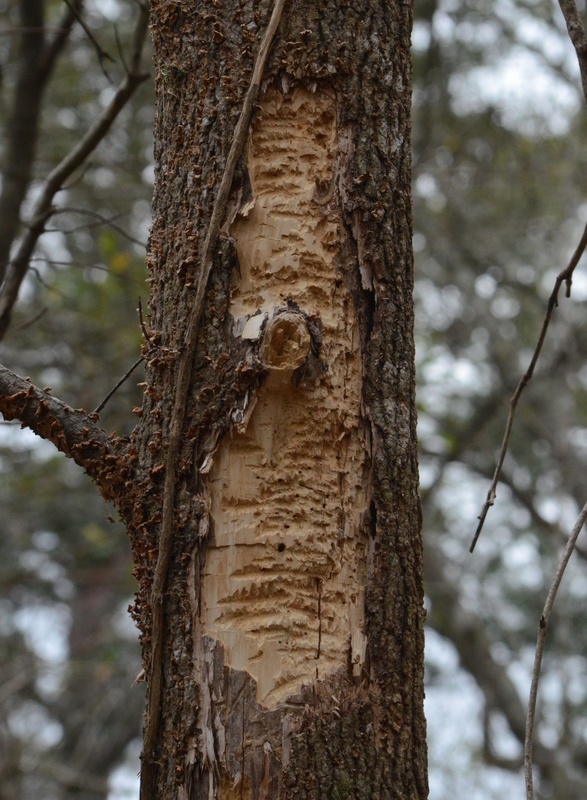 Edited to add: I think squirrels can also be ruled out for this work due to the involvement of the sapwood, apparent bill marks, and the presence of insect tunnels. I think that all of the images immediately above show Ivory-billed Woodpecker work, most of it fresh. The similarity in general appearance from tree to tree should be self-evident. This type of scaling can be found from within approximately one foot off the ground to the upper parts of boles. Large Cerambycid exit tunnels are visible in the sapwood. Bark chips, when found, were large, and the only hints of excavation involved targeted digging to expand the exit tunnels. 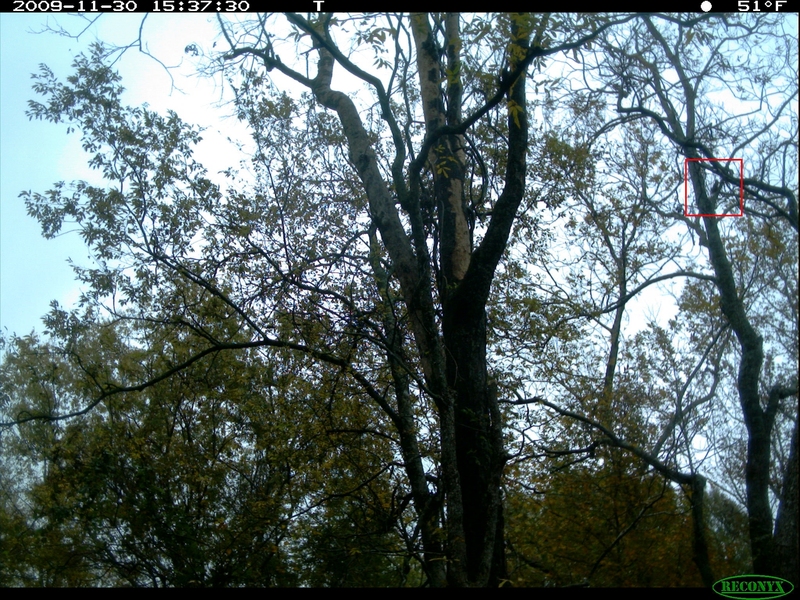 It’s worth noting that the Hairy Woodpecker in the trail cam photo above spent several minutes removing a quarter-sized piece of bark. The Pileated Woodpecker also spent several minutes on the tree; it pecked and gleaned and looked around but did no excavating or scaling. In my view, this very specific type of work is diagnostic for ivorybill and is beyond the physical capacity of the Pileated Woodpecker. I’d suggest that similar appearing work on other tree species should be considered strongly suggestive. When it comes to the high branch work that Tanner emphasized, it is more difficult to rule out Pileated Woodpecker. As discussed in several recent posts, this type of foraging was the predominant one during breeding season and immediately after fledging young, at least for the John’s Bayou family group. Thus, for work higher on trees, where bark is thinner and tightness cannot be assessed, abundance is likely a key indicator. From this perspective, it may be significant that our friends the Carlisles who are searching in the Pascagoula area have found only two sweet gums with work that I consider to be intriguing and consistent with what’s described in the literature. By contrast, I found over 50 such trees in our area in the 2015-2016 season alone. Whether or not there are ivorybills in the Pascagoula, the difference between the Carlisles’ observations and ours is dramatic and suggests that something unusual is going on in the Project Coyote search area.